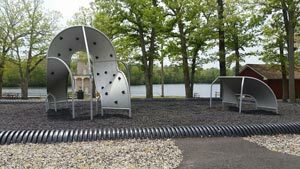 Lake Lenape Park East and Lake Lenape Park West are located in Hamilton Township and together encompass nearly 2,000 acres of land. Each park offers a variety of activities and facilities for residents and visitors to enjoy with its own entrance and access points. Boating is allowed on the lake with proper permits as required. All boaters must comply with state regulations and laws. See below for more information. This park is located on the western side of Lake Lenape (note that some land on the eastern side and the entire lake surface is controlled by the county). The park entrance is located at 6303 Harding Highway in Mays Landing and encompasses nearly two-thousand acres of land, all the way up to the Black Horse Pike (Route 322). All boaters must comply with state regulations and laws. No personal watercraft are permitted. For information on obtaining a boating permit and the associated fees visit the Boating on Lake Lenape webpage. 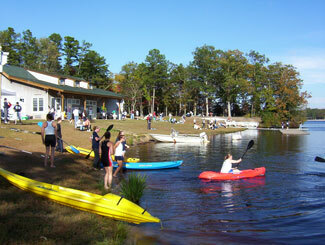 Or you can contact the Lake Lenape Park office for boat permit information at (609) 625-8219. 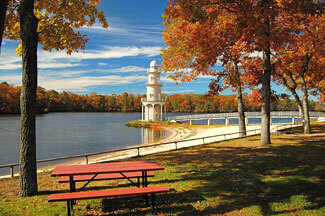 See Atlantic County Parks Camping Page for information and fees. Lake Lenape is an excellent place to site Bald Eagles in the winter. Parent or adult caregivers MUST supervise the child's use of the playground equipment. Benches are provided for your comfort. Please do not use equipment if it is wet. Falls occur more often on wet, slippery equipment. Please use equipment in the manner as indicated by posted signs. Please report any apparent damage or hazards to the Nature Center or a Park Ranger. Planning a party or a wedding? Come check out our gazebo. The gazebo is located near the playground with a lake view. For more information on reserving the gazebo please call (609) 625-8219 or see the reservations page below for more information. 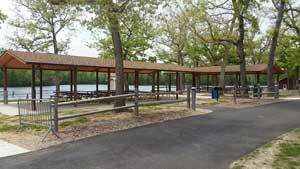 This park is located on the eastern side of Lake Lenape. 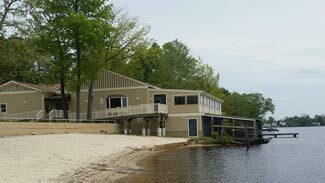 The park address is 753 Park Road, Mays Landing and offers some of the most scenic views of Lake Lenape. Renovations have been made to this park that include new pavilions and a refurbished catering hall that is currently available on Saturdays and Sundays throughout the year with seating for 100 with 16 eight-foot tables and 100 chairs. The Pavilions are located near the playground with a lake view. For more information on reserving the pavilions please contact us at (609) 625-8219 or see the reservations page below for more information.